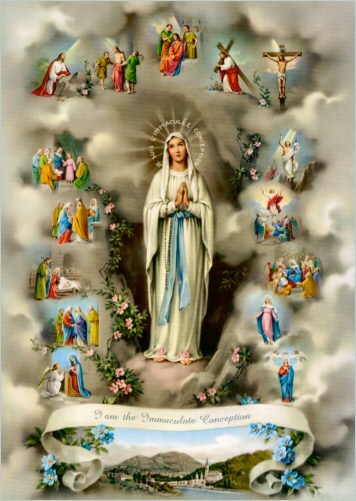 Our Lady Of Lourdes, Novena. O Mary Immaculate, Our Lady of Lourdes, Virgin and Mother, Queen of Heaven, chosen from all eternity to be the Mother of the Eternal Word and in virtue of this title preserved from original sin, I kneel before you as did little Bernadette at Lourdes and pray with childlike trust in you that as I contemplate your glorious appearance at Lourdes, you will look with mercy on my present petitions and secure for me a favorable answers to the requests for which I am making this novena. Please watch over the Doctor who will perform a biopsy on me tomorrow, that the result is negative. Also for Nicia, please guard her. The new work environment for Nicia has a positive influence in her life, relieve her of anxiety. Please surround Marjorie with blessings from your Son, Jesus Christ. Please direct me to an excellent surgeon to perform this procedure, as I do not want to lose the tip of my nose. I await for your loving Arms to embrace me and give me strength.